Sinfonia No. 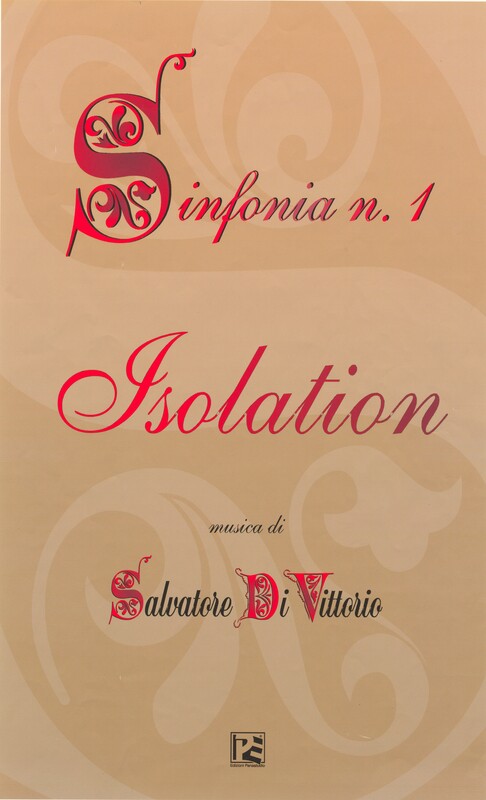 1 “Isolation”, for string orchestra, was composed in 1994 and then revised in 1999. As a program symphony, Sinfonia No. 1 depicts man’s isolation or alienation from himself (his inner being and spirit) and, most importantly, his fellow man and the surrounding world. It is based on original folksongs. With Sinfonia No. 1, I am simply trying to express human emotional and spiritual longing, man’s longing for his enlightened inner self. The programmed music is an illustration of emotional surge or force of soul, that which ties the individual to, and hungers for, the universal. The symphony attempts to reveal the truth about our human bonding, that humanity exists, as realized through love, in light of such unity. Sinfonia N. 1 “Isolation”, per orchestra d’archi, e’ stata composta nel 1994 e poi revisata nel 1999. Come una sinfonia con programma, Sinfonia No. 1 dipinge l’isolamento dell’essere umano (della sua esistenza interiore e spirituale) e, anche piu importante, quella dell’uomo universale con il mondo circostante. E’ basata su canzoni originali. Con Sinfonia No. 1, sto cercando di convogliare un foro per brama emotiva e spirituale, il desiderio umano per la sua esistenza illuminata. La musica e’ un illustrazione della forza del’anima, cioe, quel che allacia l’individuale a, e a fame per, l’universale. La Sinfonia sforza a rivelare la verita sul vincolo umano, cioe, che l’umanita esiste, realizata nel amore, in luce di questa unita.